June 29 - Saints Peter and Paul, Apostles – Solemnity - My Catholic Life! Jesus Christ is the head of the Church. The Pope is the head of the churches. The invisible, heavenly Church, mystically depicted by the Book of Revelation and described by Saint Paul as “our mother,” is the “Jerusalem above” (Galatians 4:26) or the New Jerusalem. This inner Church of God is perfect and has theological priority over all earthly churches, which are its shadow. The first Christian congregation was not just the local Church of Jerusalem. The Jerusalem Church anticipated, and grew into, the universal Church. In other words, the entire Church was present in the Jerusalem Church. And from this original whole, smaller parts formed, until the one Church became present throughout the world. In the same fashion that the inner, mystical Church of God has theological priority over its earthly mirror, the universal Church has priority over a particular church, or diocese. The many dioceses throughout the world are not stitched together into a patchwork quilt called the universal Church. Catholicism is not an international federation of dioceses, the sum total of many additions, or the end result of its own geographic or historical stretch. Unity exists, then spreads. The children do not create the parents. The one Church precedes the many churches and gives them birth. The progression is from God outward, from spirit to flesh, from ontological to historical, from Jerusalem to Rome, and from Rome to the world. All dioceses are sisters to one another. So the Archdiocese of Manila, Philippines, is a sister to that of Vilnius, Lithuania, and the Archdiocese of Lagos, Nigeria is a sister to that of La Paz, Bolivia. But the universal Church is not herself a diocese and has no sisters, lest her oneness be false. The universal Church is a mother, not a sister. And the mother Church was established in Rome by Saints Peter and Paul, whose feast day we celebrate today. This feast is, at heart, a commemoration of Rome’s role as mother, or head, church. Rome’s particular vocation is to preserve the unity of God’s church on earth. This vocation is not external, or an accidental historical addition, to the church’s original, pristine, nature. Unity is intrinsic to the Church’s theology. And there must be a practical force or power, internal to the Church, to preserve her unity. God’s Son, after all, has only one bride, and they celebrate only one heavenly banquet for only one eternal, mystical, wedding. In Matthew’s gospel Christ states, in unmistakably clear language, that he will build his Church on Saint Peter (Mt 16:17-19). For many centuries this text has been commonly cited, and logically so, in support of Roman primacy, and even infallibility. Yet a more fundamental historical fact originally supported Roman primacy. The great Saint Irenaeus clarifies the matter, as early as the late second century: Rome is “the greatest and most ancient Church, founded by the two glorious apostles , Peter and Paul.” No other city could claim, or ever has claimed, to be the seat of two martyred apostles. Not Jerusalem, not Antioch, not Alexandria, and not Constantinople, the “New Rome,” where not one single apostle was martyred. Rome’s headship is built on the deaths of Saints Peter and Paul more than on Christ’s words that Peter will be the rock. Rome, the two-apostle city, continues to draw pilgrims. If a plumb line were dropped hundreds of feet from the cross crowning the dome of St. Peter’s basilica it would rest directly over the tomb of the apostle himself, in the dark and rock below the Basilica’s main altar. A few miles away, under the main altar of the Basilica of St. Paul Outside the Walls, lies the mortal remains of the great Apostle to the Gentiles. The inscription naming Saint Paul on an ancient marble cover for the tomb leaves no doubt. The cover is even perforated with small holes where pilgrims could lower ribbons to touch Saint Paul’s bones and thus complete their pilgrimage to Rome with a third class relic. Our beautiful Church is a miracle. Theologically perfect but humanly flawed. Mystical and historical. All soul and all body. The Church reflects mankind. Capable of so much, yet limited by her imperfections. The Church is founded upon a perfect God and two very different, great, and imperfect men whom God chose – Peter and Paul. 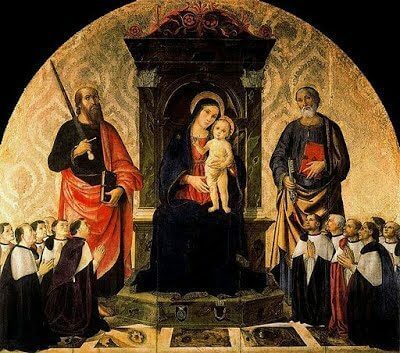 Saints Peter and Paul, deepen our filial devotion to our Mother the Church, who gives us life through the sacraments and who preserves our hope of attending the eternal banquet of God in heaven. Protect our Mother from corruption to be a more perfect spouse of Christ. PETER was of Bethsaida in Galilee, and as he was fishing on the lake was called by Our Lord to be one of His apostles. He was poor and unlearned, but candid, eager, and loving. In his heart, first of all, grew up the conviction, and from his lips came the confession, “Thou art the Christ, the Son of the living God;” and so Our Lord chose him, and fitted him to be the Rock of His Church, His Vicar on earth, the head and prince of His apostles, the centre and very principle of the Church’s oneness, the source of all spiritual powers, and the unerring teacher of His truth. All Scripture is alive with him; but after Pentecost he stands out in the full grandeur of his office. He fills the vacant apostolic throne; admits the Jews by thousands into the fold; opens it to the Gentiles in the person of Cornelius; founds, and for a time rules, the Church at Antioch, and sends Mark to found that of Alexandria. Ten years after the Ascension he went to Rome, the centre of the majestic Roman Empire, where were gathered the glories and the wealth of the earth and all the powers of evil. There he established his Chair, and for twenty-five years labored with St. Paul in building up the great Roman Church. He was crucified by order of Nero, and buried on the Vatican Hill. He wrote two Epistles, and suggested and approved the Gospel of St. Mark. Two hundred and sixty years after St. Peter’s martyrdom came the open triumph of the Church. Pope St. Sylvester, with bishops and clergy and the whole body of the faithful, went through Rome in procession to the Vatican Hill, singing the praises of God till the seven hills rang again. The first Christian emperor, laying aside his diadem and his robes of state, began to dig the foundations of St. Peter’s Church. And now on the site of that old church stands the noblest temple ever raised by man; beneath a towering canopy lie the great apostles, in death, as in life, undivided; and there is the Chair of St. Peter. All around rest the martyrs of Christ—Popes, Saints, Doctors, from east and west—and high over all, the words, “Thou art Peter, and on this Rock I will build My Church.” It is the threshold of the apostles and the centre of the world. Reflection.—Peter still lives on in his successors, and rules and feeds the flock committed to him. The reality of our devotion to him is the surest test of the purity of our faith. ST. PAUL was born at Tarsus, of Jewish parents, and studied at Jerusalem, at the feet of Gamaliel. While still a young man, he held the clothes of those who stoned the proto-martyr Stephen; and in his restless zeal he pressed on to Damascus, “breathing out threatenings and slaughter against the disciples of Christ.” But near Damascus a light from heaven struck him to the earth. He heard a voice which said, “Why persecutest thou Me? ” He saw the form of Him Who had been crucified for his sins, and then for three days he saw nothing more. He awoke from his trance another man—a new creature in Jesus Christ. He left Damascus for a long retreat in Arabia, and then, at the call of God, he carried the Gospel to the uttermost limits of the world, and for years he lived and labored with no thought but the thought of Christ crucified, no desire but to spend and be spent for Him. He became the apostle of the Gentiles, whom he had been taught to hate, and wished himself anathema for his own countrymen, who sought his life. Perils by land and sea could not damp his courage, nor toil and suffering and age dull the tenderness of his heart. At last he gave blood for blood. In his youth he had imbibed the false zeal of the Pharisees at Jerusalem, the holy city of the former dispensation. With St. Peter he consecrated Rome, our holy city, by his martyrdom, and poured into its Church all his doctrine with all his blood. He left fourteen Epistles, which have been a fountain-head of the Church’s doctrine, the consolation and delight of her greatest Saints. His interior life, so far as words can tell it, lies open before us in these divine writings, the life of one who has died forever to himself and risen again in Jesus Christ. “In what,” says St. Chrysostom, “in what did this blessed one gain an advantage over the other apostles? How comes it that he lives in all men’s mouths throughout the world? Is it not through the virtue of his Epistles?” Nor will his work cease while the race of man continues. Even now, like a most chivalrous knight, he stands in our midst, and takes captive every thought to the obedience of Christ. Reflection.—St. Paul complains that all seek the things which are their own, and not the things which are Christ’s. See if these words apply to you, and resolve to give yourself without reserve to God.